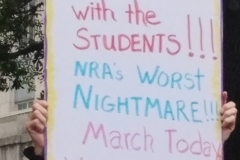 At the March for Our Lives rally in downtown Houston on March 24, student organizers became involved for different reasons, but the overall sentiment was the same. Change needed to happen to make schools safer so that no student could lose their life to gun violence. Student organizers, family, friends and supporters came together because of the Parkland High School shooting that resulted in 17 student deaths. The student survivors of the mass shooting have dominated headlines since the tragedy on February 14th because shortly after the shooting they became vocal advocates for addressing gun violence in schools. Over 15,000 people attended the rally at Tranquility Park which was part of a coordinated national day of action to raise awareness to gun violence. Some local politicians and leaders were also in attendance to show support for the cause. 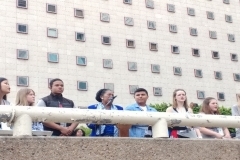 Student organizers locked arms with Houston Mayor Sylvester Turner, Houston Police Chief Art Acevedo and Lee as they marched towards Senator Ted Cruz’s office. Chants of “Vote Cruz Out” rang through Travis street in downtown. The march ended back at Tranquility park where organizers thanked everyone and urged those in attendance to vote. .